Book News: Stephen King's New Bogeyman? Digital Publishing : The Two-Way Also: the legacy of Kierkegaard; the creator of Lyle Crocodile has died; Aussie airliner Qantas commissions flight-length books. 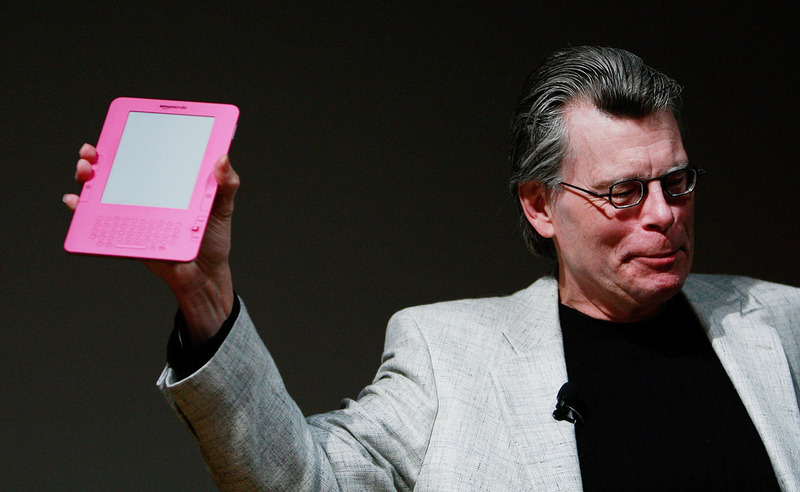 Stephen King holds a special pink Kindle given to him at a 2009 unveiling event for the Amazon Kindle 2. Stephen King says his next book, Joyland, will be available only in print. He recently told The Wall Street Journal: "[L]et people stir their sticks and go to an actual bookstore rather than a digital one." Interestingly, King was actually one of the first mainstream authors to go digital: Back in 2000, Riding the Bullet was released as the first mass market ebook. A New York Times article from that year discussing the quaintly described "Internet-only novella" quotes one prominent literary agent as saying, "That's a fellow sitting up in Maine having fun, but it's not a way to run a business." Nobel laureate Wole Soyinka takes on Western critics who call the late Nigerian novelist Chinua Achebe the "father of African literature" in an interview with SaharaReporters: "It legitimizes their ignorance, their parlous knowledge, enables them to circumscribe, then adopt a patronizing approach to African literatures and creativity. Backed by centuries of their own recorded literary history, they assume the condescending posture of midwiving an infant entity." Achebe died in March. Raymond Maxwell, one of four State Department officials disciplined following the attack in Benghazi, Libya, expresses his thoughts on the scandal with some vitriolic poetry. One poem, quoted by CBS, reads "The Queen's Henchmen / request the pleasure of your company / at a Lynching - / to be held / at 23rd and C Streets NW [State Dept. building] ...A blood sacrifice- / to divert the hounds- / to appease the gods- / to cleanse our filth and /satisfy our guilty consciences..." Subtle. The Australian airline Qantas is commissioning novels that supposedly last the precise lengths of their most popular flights. The project, a collaboration with publisher Hachette, is called "Stories for Every Journey." Judith Thurman considers the legacy of Soren Kierkegaard for The New Yorker: "Either/Or...ought really to be subtitled Neither." Children's book author Bernard Waber died on Monday, according to his publisher, Houghton Mifflin Harcourt. Lyle, a crocodile that lives in a bathtub, was the star of Waber's two most famous books, Lyle, Lyle Crocodile and The House on East 88th Street.